The 4K Ultra HD Blu-ray format is generating some buzz out of CES 2017 this week, with both Panasonic and Sony revealing their new UHD players. 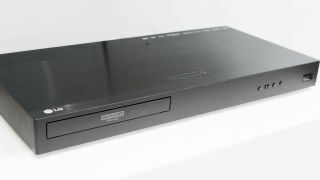 Now, LG has also unveiled its first 4K Ultra HD Blu-ray player with the announcement of the LG UP970. While most 4K Ultra HD Blu-ray players only support the HDR10 standard for vibrant and colour-rich high-dynamic-range visuals, the LG UP970 will also support the technically superior Dolby Vision format. Makes sense, as LG has been pushing the standard pretty hard with its Dolby Vision-capable OLED TVs lately, such as the fantastic LG Super UHD 65UH950T, in which we called its Dolby Vision performance “mind-blowing”. The UP970 will have two HDMI ports, including an HDMI 2.0a port for Ultra HD video output and an HDMI 1.4 for audio output. In terms of compatible sound formats, it will support Dolby TrueHD, Dolby Atmos and DTS-HD Master Audio. That said, the player won’t ship with Dolby Vision capability from the get go – that will come in the form of a software update scheduled for later this year. Pricing and release date information has yet to be revealed, but we’ll let you know as soon as these details become available.